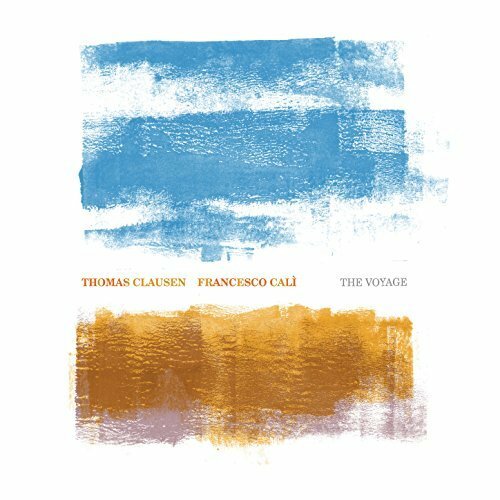 Thomas Clausen: piano; Francesco Cali: accordion. Recorded at Nilento Studios, Gothenberg, Sweden, February 7th and 8th 2016. Veteran Dutch pianist, Thomas Clausen was one of the pianists on Miles Davis’ ‘Aura’ session and has performed with Palle Mikkelborg and a host of international jazz stars. Francesco Cali is a Sicilian accordionist, pianist and composer. Both are currently based in Copenhagen, Denmark. On this CD they play a sequence of 23 miniatures that were originally composed for Rio Rose’s 2015 play ‘The Arrival’ (based on Shaun Tan’s beautiful 2006 graphic novel of immigration, solitude and hope in which a man leaves his family to find work abroad). The pieces can be heard as a commentary on the graphic novel and fit with the changing moods of the story. Indeed, if you are fortunate enough to hear this played live, images from the graphic novel are projected as the backdrop to the performance. Equally, the pieces can be imagined as the soundtrack to a silent film of one’s own imagination. They have something of the drama and pathos of the accompaniments of the films of the 1920s, perhaps a little more Chaplin than Keaton with the ways in which the ebbs and flows of the music tug at the listener’s emotions. At times, Cali’s accordion has the plaintive sound of a harmonica and at others it has the blowsy tones of a barrel organ on a street corner. Against and across Cali’s playing, Clausen plays a straight, romantically included accompaniment which provides a lovely blended tonality to pieces with titles that range from ‘Alone’ to ‘Street Life no. 1’ to ‘Factory Life’ to ‘Battlefield’ to ‘Bliss’. In these pieces there is the sense that one is listening to a complete life; not just complete in the sense of cradle to grave, but also complete in the sense of experiencing all manner of emotions and situations. The simple, melancholic themes introduced in the initial pieces are picked up later, to provide continuity and a sense of the unfolding of the protagonist’s life in broad brush strokes. The pairing of piano with piano accordion, in the hands of these masters, proves compelling and ultimately life-affirming and inspirational.